works well, was a good value for the price. This user was entered into a sweepstakes after submitting their honest review. This one-inch curling iron from Conair reduces frizz for silky, shiny results. A ceramic-coated barrel heats evenly to prevent damaging hot spots. Create any hairstyle with ease when you use this Conair ceramic one-inch barrel curling iron. The styler is a real timersaver, ready to go in less than 30 seconds, and features 30 different heat settings for any style. This curling iron includes a heat shield and an automatic shutoff for safety and easy storage. Needed a dual voltage iron for upcoming travel. Have only used it on 110 current so far. It does what it's supposed to do. Pros: My hair is fine, hard to style, and I have a lot of it. The iron styles well and in a satisfactory amount of time. I use it on the highest heat setting and it does not damage my hair. Good cool tip (no burned fingers). It's quite light for a full-size iron. Cons: The kick stand could use a re-design, but it's ok. The iron comes with a snap-on heat-protective sleeve made out of some type of plastic lattice-work. I don't want to take any chances throwing a hot iron into a suitcase, so I went ahead and bought regular insulated 'envelope' style cover separately. Second one I've owned. It's GREAT!!! This is the second curling iron just like this I've owned. The first one lasted years and years, until I wore out the on/off button. So far, the second one is working just as well as the first. Heats up super fast. Quick, smooth, effortless curls. I always keep the heat turned up to the max, 30, and have never experienced any hair damage from this product. Easy to use. I love the new heat protection cover that came with the current model. I can put the iron away still warm with the cover on. Needed a smaller curling iron and this one is perfect, heats up fast and has automatic turn off. because of endless periods of snow on long island (including today's first day of spring) and not being able to get to the hairdresser, this curling iron has come to my rescue. my hair is thin and straight, this curling iron provides body, style and complete look. it's great at home and for travel. The best, so worth the money. Heats up super fast, like the option of different heat sets! I have used this at least 6 times and my hair is very fine an frizzy as I highlight it. When I use a dry oil (just 3 drops) and then use this curling iron my hair looks healthy and has volume. Good purchase!! This has been the best curling iron that I have purchased in about 10 years! It is hands-down the easiest to use and it doesn't burn my hair. I love love love it! Highly recommended for the price and the value! This was exactly what I needed and perfectly sized. works well, was a good value for the price. Works great use it daily. Have given others as a gift! Works well. However, hair slips easily. Love it. Excellent product for the price. "How does this curling iron switch from one voltage to another? Is there a switch? 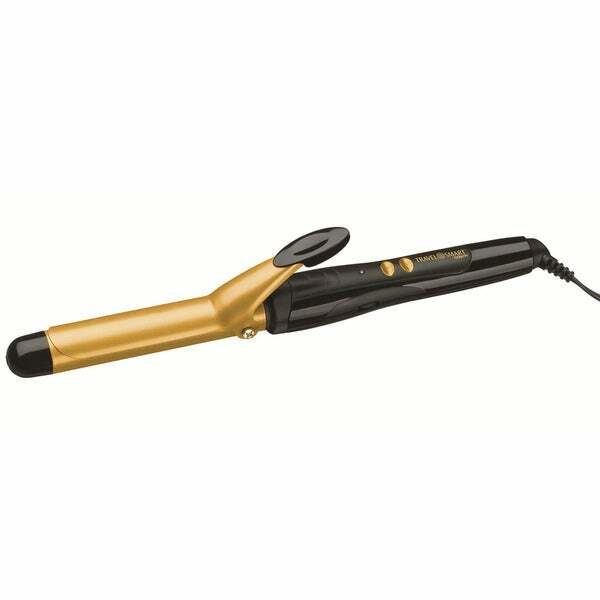 240 vs 110-160 volt, Please verify that this curling iron will actually work in dual voltage." Conair is a company has been used in the past inn my home and lasted a long time plus the price was right. I read the reviews and this product seemed to have all that I was looking for in a curling iron. "How long is the cord and is it swivel? Thanks"
Hi weatie, extra long professional length cord approx 36 inches. Please feel free to contact us again with any further questions. Thank you for shopping with us! Yes the cord is swivel.